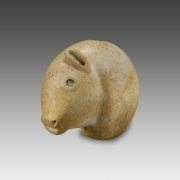 Categories: Animals, Sculpture. 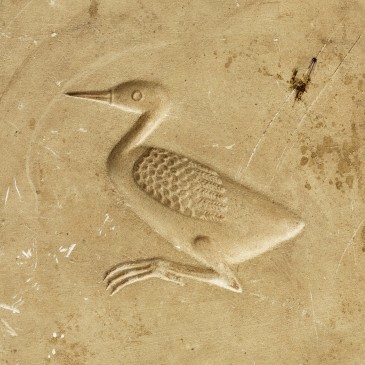 Tag: Egyptian Mold with a Seated Bird. 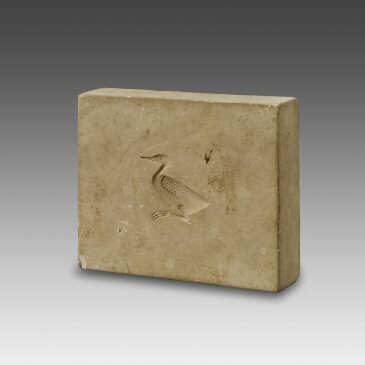 This rectangular plaque is perfectly regular and smooth; at its center, it is decorated with a bird carved out in relief. Despite a certain stylization and some unusual details (the body of the animal is heavier and shows no feathers behind the head), this bird could be the Bennu-bird, the heron, identified as the phoenix by the ancient Greeks. It is represented in profile, seated on its feet, its head directed forward; its shapes are skillfully modeled and its anatomy is rendered by many incisions that indicate the plumage of the wings, the legs, the eyes and the beak. Similar plaques were unearthed in Egyptian necropolises of the Late Period, especially at Saqqara, where they were associated with grave goods. 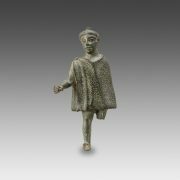 It appears that they were originally designed to manufacture statuettes with flat backs (single mold), or in the round if the mold included two parts: the material used for the image might have been wax. Later, these molds probably took on a purely symbolic meaning, replacing the three-dimensional statuette. The Bennu-bird is the most commonly attested theme on such plaques, but a mummiform figure and eggs are also documented. In Egyptian religious tradition, this bird is connected to the creator god Atum and to Osiris; at the same time, in many excerpts of the “Book of the Dead”, this bird is identified with the soul of the deceased. The exact meaning of these small plaques is not clearly determined yet, but they would certainly have been related to the magical-religious sphere, and associated with the journey of the soul of the deceased and of his rebirth in the afterlife. Complete and in excellent condition, minor chips and wear. 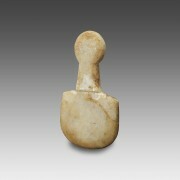 The figurine is flat and slightly rounded. The shield-shaped outline, typical of these idols known as “schematic”, probably represents the silhouette of a seated human body, but without any volume.